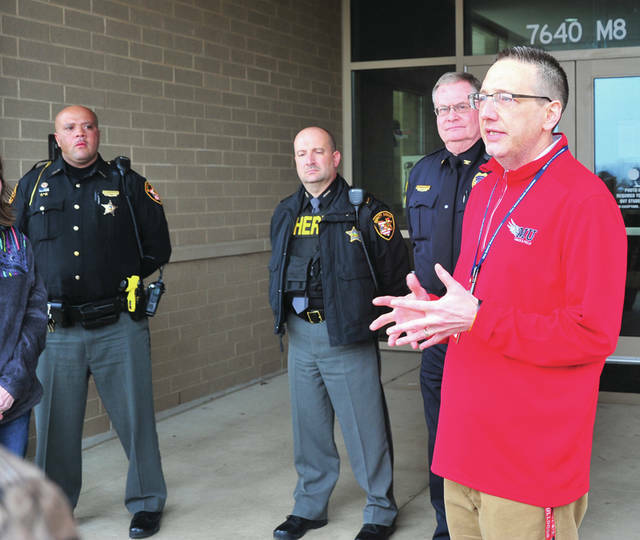 https://www.tdn-net.com/wp-content/uploads/sites/21/2019/03/web1_032919mju_muhs_lockdown1-2.jpgMike Ullery | Miami Valley Today Milton-Union School superintendent Dr. Brad Ritchey, far right, addresses parents gathered at the entrance to Milton-Union High School as Friday’s lockdown was lifted. With Ritchey are Deputy Warren Edmonson, SRO for Milton-Union, Capt. Jamie McGlinch, SRO supervisor for Miami County, and Harry Busse, West Milton chief of police.